This dish is colorful and healthy. You can save money by using all the green bell peppers. Makes 6 servings. 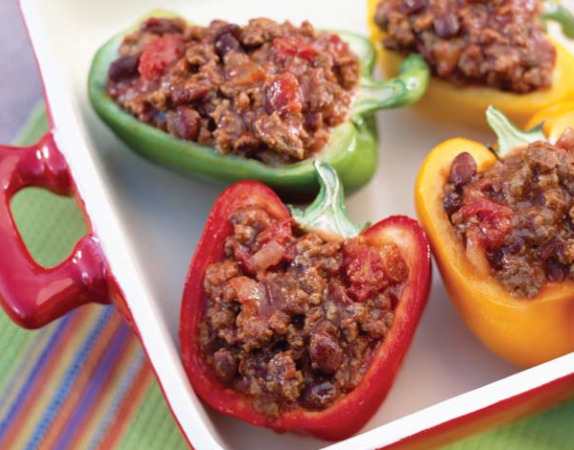 1 stuffed bell pepper shell half per serving. Brown ground turkey in a medium skillet over medium-high heat until no longer pink; drain excess fat. Add onion and cook until tender, about 5 minutes. Add all remaining ingredients except the whole bell peppers; simmer for 10 minutes over medium heat. Meanwhile, cut the whole bell peppers in half lengthwise and remove the seeds. Place in a microwave-safe dish with a small amount of water. Cover and microwave bell pepper on high until crisp-tender, for about 5 minutes. Remove peppers from the dish and place on a large plate. Spoon turkey mixture into bell pepper shells and serve.